Sam Twyford-Moore is the founding host of The Rereaders, a fortnightly literary and cultural podcast. 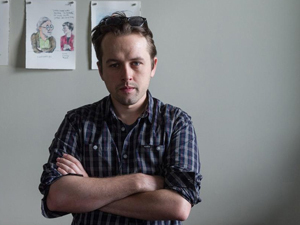 He is a former Festival Director and CEO of the Emerging Writers’ Festival. Sam published The Rapids: Ways of Looking at Mania in 2018. I can go one better: the last good book I read was one of the greatest books I’ve ever read. I finally got around to reading Shirley Hazzard’s Transit of Venus and I was totally floored by it. It’s just a perfectly formed novel, with a great sense of unfolding time, and really the best novel I’ve ever read by an Australian. I think a love of libraries really starts in childhood and so despite my love the innovations of contemporary libraries – their integration of digital technology and mediums other than the good old book – I’ll forever be indebted to, and so deeply in love with, the small, essentially single room that is Toukley library, where I spent many happy days as a boy roaming the shelves. I found a whole other world there. I have found it funny that a number of responses to my book have described it as being like a chat with a good friend at a pub. That certainly wasn’t my intention, so I must be quite chatty in prose. The stranger end of this was someone described reading my book like having a chat with an older brother. I'm not unhappy with this. Don’t take yourself too seriously until the situation really requires it. My book, The Rapids, is partly a cultural history of manic depression – and I was inspired to write that because I hadn’t really seen that topic written in that way. I’d seen plenty of memoirs or medical texts but I was really interested to hybridise as many forms as possible and see what came of it, whether I could capture the historical march of the condition or its individualised experience. Want to read more about The Rapids? Writing and mental illness make excellent bedfellows, for better or worse. 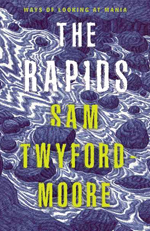 The Rapids - creative and courageous - is an extraordinary personal memoir peppered with film and literary criticism, as well as family history. With reflections on artists such as Carrie Fisher, Kanye West, Robert Lowell, Delmore Schwartz, Paul Thomas Anderson and Spalding Gray, Twyford-Moore also looks at the condition in our digital world, where someone’s manic episode can unfold live in real time, watched by millions.